Implementation of the Recovery Package is a priority in the recent NHS England cancer strategy, but information on local workforce readiness to implement the package was unavailable. Therefore, a survey of the lead cancer clinician and lead clinical nurse specialist for each cancer multidisciplinary team across Sheffield Teaching Hospitals NHS Foundation Trust was undertaken to measure understanding of the Recovery Package, good practice and gaps in service provision. 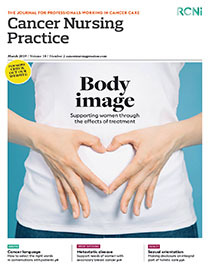 This article reports on the results of the survey, which found that the Recovery Package’s terminology – particularly the word ‘recovery’, which implies the package is relevant only for those treated curatively – has led to misunderstandings and that implementation has been variable across cancer teams. The article also discusses proposed solutions, which include improving medical staff awareness, reviewing nurse specialist workload and considering different ways of working.